As a RICS Surveyor in France, we see that one of the largest causes of damage and degradation to houses is caused by the presence of damp. This in turn creates the perfect environment for wood rot and wood boring insects that can cause a huge amount of damage to timber structures. 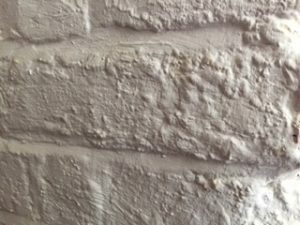 Damp in masonry may cause spalling and degradation of stonework and ‘blowing’ of render, in addition to corrosion of steel reinforcing rods within concrete structures. As the steel rusts it expands and the concrete surrounding the steel becomes detached. This compromises the structural capability and ultimately leads to failure. As a RICS Surveyor in France we see particular examples of damp being introduced to buildings, often as a result of modern building materials and repairs being inappropriately applied to houses of traditional construction. However, there is an enormous and ever increasing promotion of so called ‘energy saving measures’ that seek to reduce energy consumption and CO2 emissions from houses. 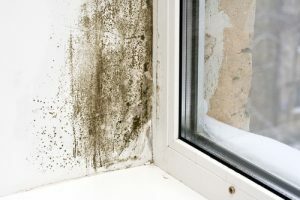 Despite the degradation caused by damp, ironically these initiatives often promote the eradication of drafts with the installation of modern windows that seal without any air gap, the introduction of draft seals and huge amounts of insulation to lofts. Whilst such advice is well intentioned, sadly the logic is flawed and counter productive when applied to traditionally constructed properties. The reason is that older properties often have solid stone walls and floors, without damp proof course or cavity. The design on construction was to allow the damp to escape from the house via gaps in windows and beneath doors and through vapour permeable materials. This allows the house to ‘breathe’ and remain dry. This in turn allows the house to remain free from wood rot and insect attack etc. Even ignoring damp ingress through leaks etc, the production of water vapour can be huge from every day living including breathing, showers, cooking etc. From these every day activities, 4 occupants within a house will typically produce approximately 5 litres of water per day. So 150 litres of water carried within a much larger volume of air needs to be ventilated out of the house every month, otherwise water will be absorbed into the plaster of walls and timber joists etc. In addition of course the natural dampness from the ground, and building fabric needs to be extracted from the house. 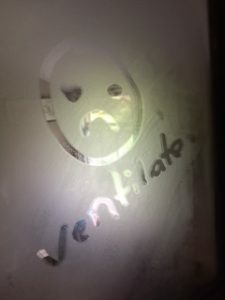 Damp air condensing on window. A similar process takes place to non-permeable materials within walls etc but is concealed from view. Ironically the result of the ‘energy saving measures’ can result in reduced ventilation that in turn can result in degradation of the building fabric. This may then require extensive timber and other repairs to be needed. These repairs including the replacement materials are likely to result in the consumption of much more energy and production of more CO2 emissions than the ‘energy saving measures’ could ever have achieved. Furthermore, the financial cost of the repair works is likely to be significantly more than any perceived energy cost saving. As a Surveyor in France, we understand the logic of traditional and modern construction methods. Our Surveys in France take account of the construction method adopted in the house. This will also influence our corresponding approach and advice as to ventilation. When undertaking RICS Surveys we also provide forward looking recommendations and care plans that will help keep the structure dry and thus naturally resilient to wood rot and insect attack, and also preserve the masonry. Accordingly the house will also be more environmentally sustainable. These principals will be valid at the date of the Survey Report and equally valid for generations to come. http://www.propertysurveysfrance.com/wp-content/uploads/2017/09/logo6.jpg 0 0 duncan http://www.propertysurveysfrance.com/wp-content/uploads/2017/09/logo6.jpg duncan2016-05-14 10:21:352018-05-29 12:49:13RICS Surveyor in France. Go 'green' with period property and ventilate, ventilate, ventilate!!! The following blog summarises the strategic approach to combat termites in France. As a Building Surveyor in France we adopt this approach when undertaking surveys. Termites are small insects that feed upon the cellulose of wood. There are 7 species found in France, most prominently in the South West albeit they are expanding info further areas as the climate warms. They live in sophisticated colonies organised into various specialist teams that gives them the ability to destroy timber structures with alarming speed and efficiency. Furthermore, because they devour the timber from within the timber structure, their presence and destructive work may go unnoticed for years. 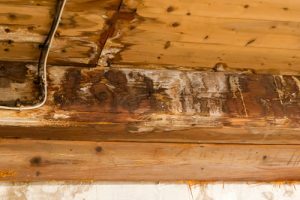 Timber beams may look sound, but have been hollowed out by the termites. This results in weakening the timber or total structural failure. Termites are therefore of concern to both homeowners and the French authorities. 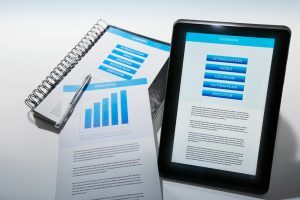 The law in France requires that when selling a house the vendor is required to commission a report within the DDT that confirms the presence / absence of termites. The report is valid for a period of 6 months and is not qualified to comment on the structure of the house nor the specific consequences of infestation to the particular elements of the building structure. The modern approach to address infestations includes replacement of damaged wood the application of chemicals to the deter future attack. However, much of the infestation will be in the timber favoured by the termites, buried deep behind masonry and therefore inaccessible to treatment. Accordingly remediation can be very costly and disruptive. As a Building Surveyor in France we provide advice to adopt a strategic approach to combat termites and importantly provide enhanced defence against future infestation. To better understand the approach, it is important to firstly understand the environment required by termites. Subterranean termites require a damp environment in which to live and avoid sunlight. They build mud tubes to allow them to travel over dry structures and remain concealed from bright light. Accordingly a key to providing a less attractive environment to termites is the removal of damp to the structure and timber within the building. This is normally undertaken by a combination of addressing faults to roofs, gutters, drainage etc in addition to ensuring adequate ventilation to floor voids, roof voids etc. It is important that humid air from within the living areas of the house is ventilated out of the house and not into the roof void. Removal of shrubs and debris etc around the base of the house will also reduce shading and allow for easier inspection and observation of any termite evidence. ‘Dry wood’ termites nest above ground and don’t require contact with the ground. Like any organism, even ‘dry wood’ termites require some moisture to live that they derive from the wood. As a Building Surveyor in France, we undertake detailed Property Survey inspections in accordance with RICS training and standards. This includes damp meter readings to timber and masonry. The Survey Report is forward looking, providing recommendations as to how to maintain and ventilate the property so as to keep the structure dry. This in turn will draw moisture away from timber imbedded within stone walls etc. The Survey also includes outbuildings and the general garden / grounds surrounding the house. Specific recommendations are made as to the type of plants / shrubs and flower bed design that should be adopted in the area surrounding the house so as to provide a hostile environment for termites. This is a critical element of the overall measures to be adopted to enhance defence to combat termite infestation. 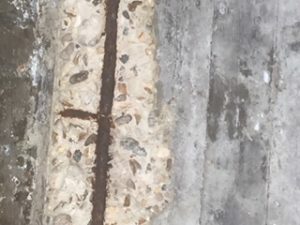 The vendor’s DDT report is valid for 6 months and is understandably caveated by the fact that the inspection cannot assess timber that is inaccessible, including that concealed behind masonry. The principles of our Report recommendations are valid for decades, and include recommendations for the drying of even the concealed timber. When undertaking an RICS French property survey, we see that many UK buyers tend to favour period properties either for permanent occupation or for holiday homes. 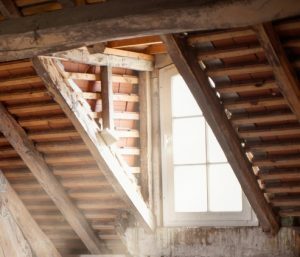 When first viewing the loft space within French properties, many buyers are often concerned to see a vast array of bright spots of sunlight piercing the gaps between tiles. Furthermore, buyers may be concerned not to see felt under the tiles as is common practice in UK construction. Their immediate response is often of alarm, with concerns as to rain water cascading through the gaps, drenching everything beneath. Often such concerns may be put to ease. To understand why, an understanding of the construction methodology is needed. It is common in France for felt not to be laid beneath the tiles, thus the underside of the tiles is exposed. The bright spots of daylight are normally via light penetrating laterally through spaces between the tiles. Clearly checks have to be made as to whether any are capable of water ingress. No felt beneath battens allowing inspection of battens and underside of tiles. If a leak does exist, the precise location of the leak can often be seen from within the loft thus facilitating repair. If the leak were onto a felt membrane, the water would then travel over the felt, often travelling horizontally for some distance having being diverted by the horizontally fitted battens. This makes identification of the precise location of the leak difficult. The felt would also direct the water to the underside of the battens making them prone to rot. The absence of the felt results in a reduced weight that would otherwise be carried by the roof structure. As a Chartered Surveyor when undertaking a detailed RICS French Property Survey we understand the logic of both traditional and modern construction. Our detailed Survey Reports understand the ethos of the architecture and construction techniques. We also provide Care Plans to allow you to adopt the correct approach to maintenance taking account of the construction. The approach to maintenance of traditional and modern buildings is necessarily very different. Armed with the French property survey report and Care Plans you can significantly reduce future maintenance and repair costs.